When people think about the size of a phone they tend to think in screen sizes, but really it’s the overall dimensions that matter most. That’s why to be considered for our list of the best compact phones a handset needs to be 145 x 70mm or smaller. In practice that includes most phones with a screen of under five inches, as well as a handful of 5-inchers, but it excludes handsets that don’t make the most of their space. There’s no room for big bezels here. Any one of the phones below should comfortably fit in your pocket and be useable with one hand. They’re also all good phones in their own right. 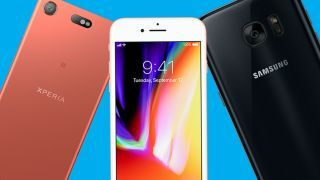 While not Apple’s best phone – that honor belongs to the iPhone X – the iPhone 8 is its best compact handset and for our money the best compact handset from any manufacturer right now. In fact, its 4.7-inch screen makes it positively tiny compared to most modern phones, but it’s got a lot going for it beyond a small footprint. The A11 Bionic chipset means there’s flagship power, while the new glass back allows for wireless charging for the first time on an iPhone. The iPhone 8 also has a great 12MP camera and a quality – albeit bezel-heavy – design that benefits from water resistance. The screen might not be the highest resolution around, but its small size means it’s still sharp, and it has advanced features like 3D Touch and True Tone. Plus, you get Apple’s tried and trusted Touch ID fingerprint scanner and iOS 11 baked in. With its 5.1-inch screen you might not think of the Samsung Galaxy S7 as a compact handset, but in fact that is quite small by modern standards, and coupled with the phone’s fairly slim bezels it just slips into the compact category. It’s also a very, very good phone. It was one of the best of 2016 and still holds up well now, thanks to its crisp and vibrant QHD Super AMOLED display, metal and glass build and top-quality 12MP camera. The octa-core chipset and 4GB of RAM ensure it’s still very powerful too, while decent battery life coupled with fast and wireless charging means you won’t have to leave it plugged in too often or for too long. It’s got a speedy fingerprint scanner too, and while it’s since been slightly shown up by the Samsung Galaxy S8, that’s a much bigger phone. Sony is one of the few companies regularly releasing high-end compact handsets, and the Sony Xperia XZ1 Compact is its latest and best. This 4.6-inch phone has a whole lot of power, thanks to a Snapdragon 835 chipset and 4GB of RAM, which are top-end specs. It also runs Android Oreo, meaning its software is more up to date than many Android phones, and it has a 2,700mAh battery which can last a day of intensive use. The 19MP rear camera is quite capable too, and at 129 x 64mm the XZ1 Compact is even smaller than most phones in this list. The design is starting to feel a bit dated and there’s no wireless charging, but otherwise the XZ1 Compact is a top choice if you want something small. After something smaller and cheaper than the iPhone 8 or iPhone 7 but that still looks and feels high-end? Then you’ll likely want the iPhone SE. This is a budget phone by Apple’s standards but it’s still not cheap, and nor should it be, given its metal build and iPhone 6S-matching specs, including a speedy Apple A9 chipset, 2GB of RAM and a decent 12MP camera. Importantly, it’s also the most powerful 4-inch iPhone available, and is easier to find than the now-discontinued iPhone 5S. The iPhone SE isn't quite the best compact iPhone you can buy, thanks to its big brothers, but if you want something truly tiny it’s hard to beat. Although beaten by the iPhone 8, the iPhone 7 is still one of the best compact phones you can buy right now. A stylish metal design with water resistance is paired with a high-quality display and a camera that excels in low light. It’s very powerful too, and isn’t quite as wallet-bustingly expensive as it once was now that it’s been superseded. It’s not a huge upgrade on the iPhone 6S, but it’s more powerful, has a better camera, and is leagues ahead of many other compact phones, which tend to be more mid-range at best. The original Google Pixel is still great phone, and with ever larger screen sizes becoming the norm we’d now consider it a compact phone. One of its highlights is the fact that it runs the latest Android software without any bloat, so it’s a clean, slick experience to use. But the Google Pixel also has a bright and colorful 5.0-inch 1080p AMOLED screen, a premium design of metal and glass and a decent amount of power, thanks to the once top-end Snapdragon 821 chipset and 4GB of RAM at its core. Note that the Google Pixel 2 is even better, but its dimensions are also marginally larger, and as it is the original Pixel only just meets our compact phone criteria. Not sold on any of the above? If you can stretch to something slightly bigger you might want to consider the Wileyfox Swift 2, which combines a great metal design with a low price, but is let down slightly by its battery and the low light performance of the camera. It's got a 5-inch screen, just like the Google Pixel, but comes in at a marginally larger 143.7 x 71.9 x 8.6mm. Speaking of the Pixel, there’s also the Pixel 2 as mentioned above. This has a 5.0-inch screen too and is a true flagship with dual front-facing speakers, a great camera and lots of power, but again, the dimensions are just that little bit too big to make our list. The Wileyfox Swift 2 Plus is also a 5-inch phone and one with exactly the same dimensions as the Swift 2 and a similar (and similarly metal) look. The main difference is that with the Plus you get 32GB of storage rather than 16GB, and 3GB of RAM rather than 2GB, and of course it comes at a higher price as a result. And then there’s the Moto G5, yet another 5-incher but at 144.3 x 73 x 9.5mm a little too chunky to make our main list. Size aside it’s a top phone for the money, with a 1080p screen, a fingerprint scanner and a surprisingly premium, partially metal body. All of these phones come highly recommended if size isn’t your main concern, and with the exception of the Pixel 2 they’re all budget handsets as well.